President Trump signed an executive order this week allowing adults who illegally enter the United States with children, claiming to be family units, to be detained together in federal facilities. “If there's no documentation to confirm the claimed relationship between an adult and a child, we [separate] if the parent is a national security, public or safety risk, including when there are criminal charges at issue and it may not be appropriate to maintain the family in detention together,” DHS Secretary Kirstjen Nielsen said at the White House Monday. 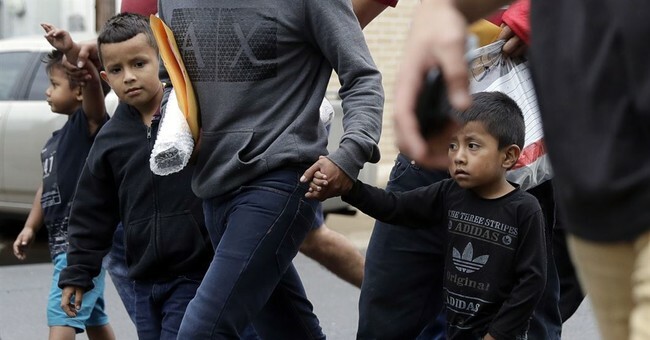 "You can never really verify who the parents really are," former Border Patrol and Customs Special Agent Jason Piccolo said during an interview with Townhall. "Especially in light of adult males showing up with kids." "Without doing some kind of in-depth interview or interrogation or some kind of biometrics [DNA] there's no way you can tell if the kids are actually family," he said. Piccolo explained how adults and children are given fake documents, including birth certificates to “prove” they are “related." “They're given fake documents in order to get through Mexico and a lot of times they'll give those fake documents back," he said. “If you really want to fix this problem you have to really vet these adults,” he said. Currently, DHS and HHS have detained approximately 2,000 minors separately from adults. Editor's note: A previous version of this story read, "disrupt or destroy." The proper terms, which have been updated, are "disrupt or dismantle."